Wicked celebrated its 15th year on Broadway with a bang. Entitled “A Very Wicked Halloween: Celebrating 15 Years on Broadway”, NBC just aired a concert special hosted by none other than original leads Idina Menzel and Kristin Chenoweth. Here are some of the show’s best moments. 2. Kristin Chenoweth proves that she is the quintessential Glinda with her hilarious rendition of Popular. 7. 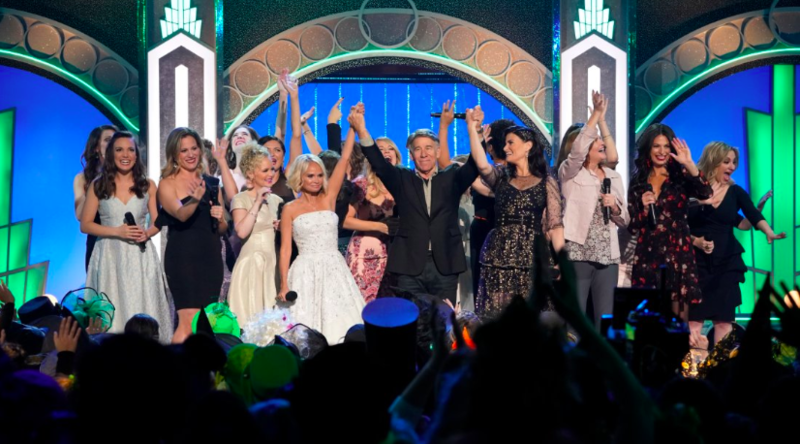 Generations of Elphaba’s and Glinda’s, led by Menzel and Chenoweth, sang a powerful, heart-warming rendition of the musical’s 11 o’clock number ‘For Good’ to close the evening. Wicked officially opened in 20013 at the Gershwin Theatre on Broadway. It won won 3 Tony Awards in 2004– Best Actress for Idina Menzel Menzel, Best Scenic Design, and Best Costume Design. Previous SNEAK PEEK: Waitress Cast Performs 'Opening Up', 'It Only Takes a Taste', and more! Next Vanessa Hudgens, Keala Settle, and more cast in Fox's Rent Live!